The Paleo Chef: Quick, Flavorful Paleo Meals for Eating Well by Pete Evans is a collection of absolutely delicious recipes. Paleo is big on vegetables and avoids refined sugars, most dairy, and grains, among other things. While I don’t follow Paleo, I thought this would be a great source of healthful recipes–I buy vegetarian cookbooks for the same reason–and it most certainly is. There are some items Evans puts forward that I can’t quite buy into yet, like the idea of “activating” nuts and seeds by soaking them before use. Overall, however, these are recipes I would absolutely make again (and again!). One of Evans’s goals is to make Paleo accessible for busy people. I’m ambivalent as to whether he succeeded or not. On the one hand, we did find most of these recipes to be pretty straightforward and simple. On the other hand, I think many people would look at the long lists of ingredients for some recipes and bounce. The length of those lists is deceptive. Much of the complexity comes from one of two places: First, many of the recipes in this cookbook are meant to be whole meals. For example, a recipe for pork cutlets includes a cabbage salad as well as a sauce. Obviously this will expand the ingredient lists. Second, many of the extended ingredient listings include a variety of spices and/or herbs, which are very easy to throw together in a moment or two. So I urge you to look past those things to the (entirely reasonable, in my opinion) amount of time and effort the whole recipe is likely to take. Recipes in here typically have a lot of flavor. We made a meatballs in chipotle sauce recipe. It used all of the chipotles in two cans, plus a dash of the adobo sauce. Very spicy, but that spiciness is moderated by a nut ‘crema’ made of chopped macadamias, lemon juice, and lime juice that did a surprisingly good job complementing the meatballs. My only dislike in this recipe was that the sauce and meatballs got rather greasy while cooking, but skimming the excess fat out took care of that with no problem. As a note, the recipes often work with amounts of ingredients that don’t end up using up, say, an entire can of whole peeled tomatoes. So we took the leftover tomatoes, tomato paste, and adobo sauce and made a lovely soup out of them. The first recipe we made out of this book, and also my favorite, is a wild salmon with coconut-lime sauce and sweet potato puree. The sauce includes lemongrass and kaffir lime leaves if you can find them; we had the former but not the latter and the dish tasted divine. I hadn’t expected a coconut/lemongrass/lime sauce to accent sweet potato in such a sharp and delightful manner. The only change we made to this recipe was to cook the salmon sous vide; this is a recipe that suits such substitutions well. We also made a few side dishes here and there. A sauteed greens recipe was deliciously lemony, and it went way past what I think of as simple “sauteed greens”. Instead of just using kale, spinach, or chard, it uses asparagus, broccolini, garlic, zucchini, green beans, and kale. It makes a fair amount, and while it can weather refrigeration and some reheating, it’s best on the first night. 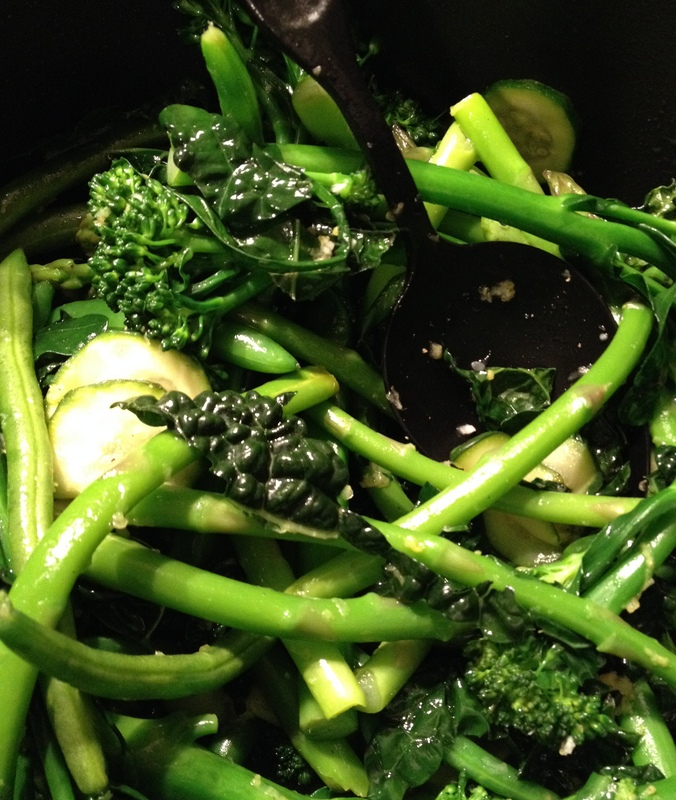 Again this recipe sounds complicated since there are somewhat different instructions for the various greens (asparagus and broccolini, for instance, get blanched and then added to the sautee pan toward the end of the cooking). It’s another recipe that sounds more complicated than it is–the blanching is quite quick and easy. One “trick” I learned from The Paleo Chef is something I intend to make extensive use of: the substitution for rice of cauliflower. You just stick the cauliflower in a food processor and pulse until the pieces are roughly the size of rice grains. (If you cut them too small then think of them as faux-quinoa.) Then the cauliflower gets sauteed in coconut oil for a few moments and seasoned with salt and pepper. It obviously doesn’t taste like rice, and it doesn’t have the consistency of rice. However, functionally it’s perfect for what it does. We served it under the meatballs with sauce and it served its purpose of taking up excess sauce so you don’t have to waste any. It also did a good job of moderating the spice in that recipe. I’m looking forward to trying more of the recipes in here, such as a chai smoothie, churros (using coconut flour and arrowroot powder), pumpkin pie with bacon bark, venison skewers with beet chimichurri, grilled honey-mustard quail, Japanese crispy chicken, with miso mayonnaise, poached shrimp with avocado-preserved lemon salad, and many more. Chapters are divided into breakfast, vegetables/sides/snacks, seafood, poultry, meat, dessert, and drinks. I suspect the next recipe we make will be sweet potato rostis with poached eggs, spinach, avocado, and smoked salmon. YUM! The Paleo Chef and Pete Evans haven’t convinced me to “go Paleo”, but I don’t think they need to. It serves as a great source of vegetable-forward recipes, judicious use of meats, and tricks like the cauliflower rice. 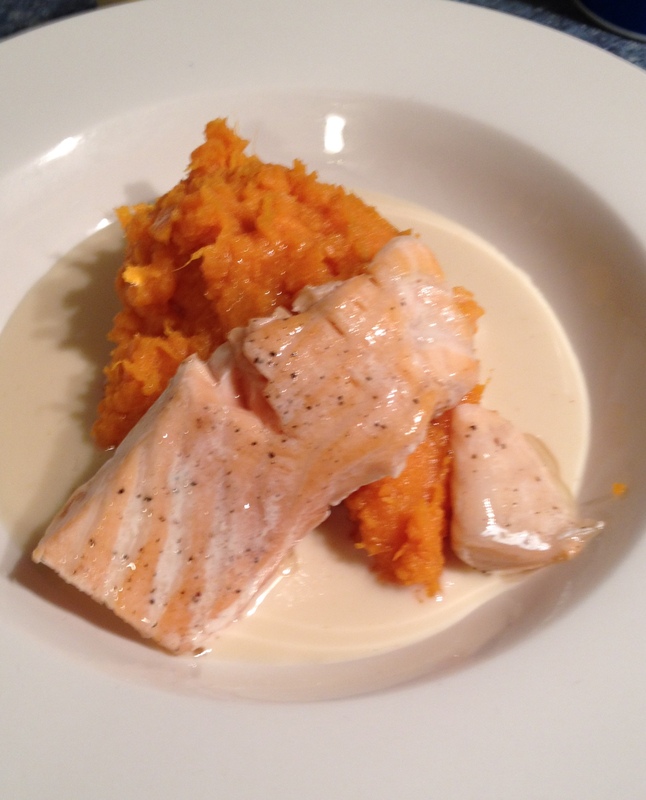 I’d also make a dish like the salmon with sweet potato puree and coconut-lime sauce as a fancy dish for friends because it’s lovely and just so tasty. This book has earned its place on our shelves. I so appreciate the review. Paleo sounds interesting but not compelling to me. This book sounds like a great way to benefit from the methodology without diving too deep.